It is no surprise to anyone anymore when they hear that the U.S. national debt is over $14 trillion (although it should), but what if you were told that the cost to simply service that debt over the next decade will be $5.5 trillion? What if you were then told that this was the absolute best case scenario as reported by the government? Tim Iacono, from The Mess That Greenspan Made, gives his take on the numbers in his blog post below. 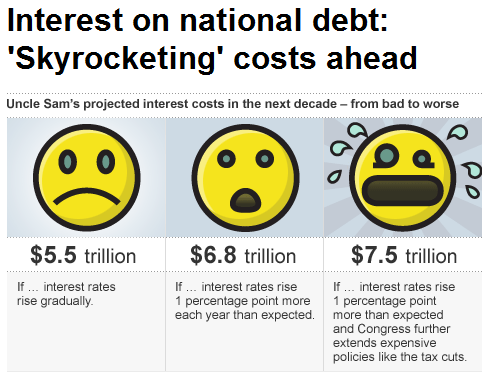 Here’s a fun little graphic from a report at CNN/Money on the possible costs to service the national debt in the not-too-distant future, that is, when interest rates are closer to historical norms, inflation in the U.S. rises to more natural levels, and the rest of the world has had more time to reflect on our borrow-and-spend ways. The scariest part of this, as noted in the story, is that the un-smiley face on the left is the optimistic scenario as presented by the Congressional Budget Office recently – debt service of more than ten times the current level. This is akin to looking back to the early-80s when the national debt was rising through the $1 trillion level towards $2 trillion, when, to most people, the idea of $14 trillion in outstanding debt would have seemed incomprehensible.